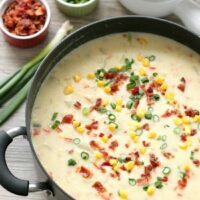 Creamy Chicken and Corn Chowder (+10 More Scrumptious Soups!) - Dessert Now, Dinner Later! 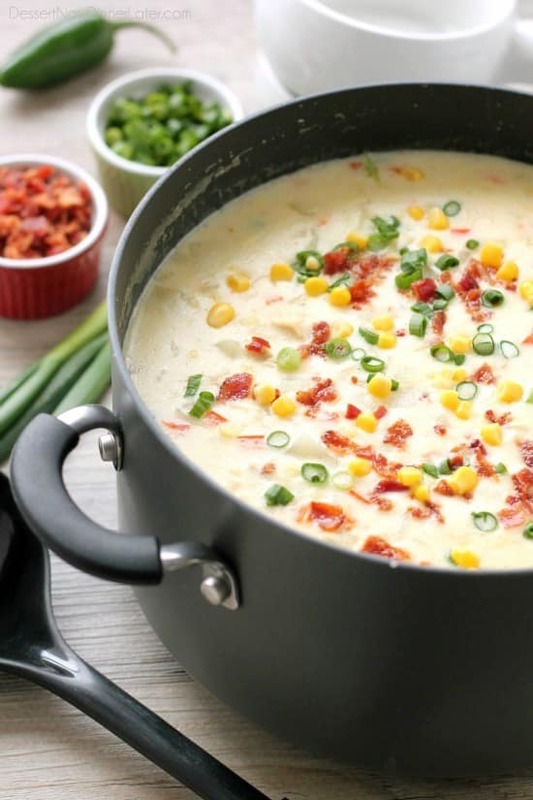 This Creamy Chicken and Corn Chowder is hearty and comforting with generous helpings of chicken, corn, bacon, green onions, potatoes and a slight kick of jalapeño. 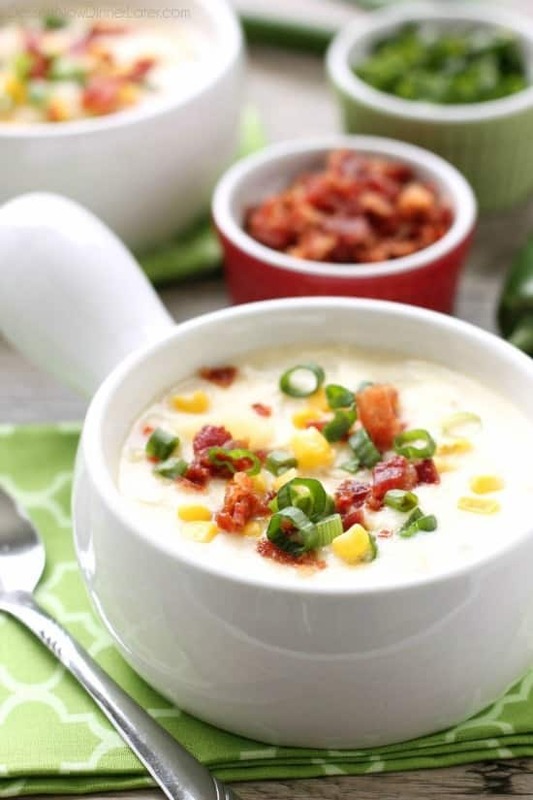 This month’s food holiday spotlight is National Homemade Soup Day and we are making corn chowder! 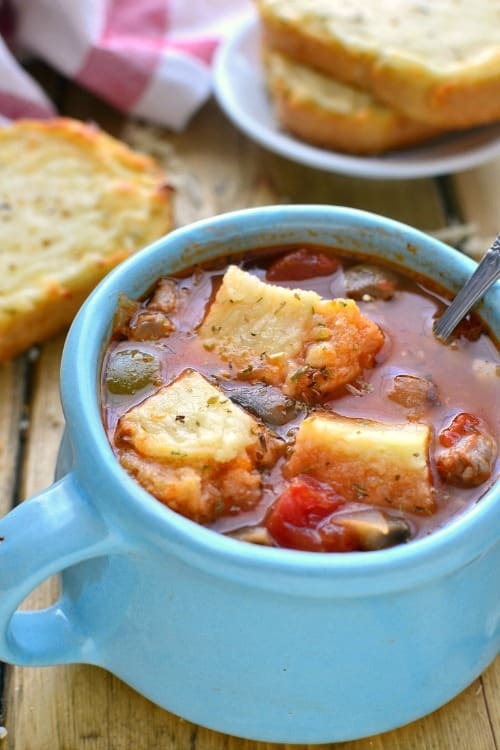 This is probably one of my favorite food holidays (celebrating soup)! Okay, let’s be honest, any food holiday is my favorite, unless it’s like seafood or mushrooms. Bleh! Now you know a little more about me, haha. Here’s something else you may not know. When I was in high school, I went to an applied technology college (ATC) to test out the culinary program there before I decided if that was something I wanted to do or not. One of my daily tasks at the ATC was making soup for the cafeteria, so I got REALLY good at making soup. Plus, soup is one of my favorite things to eat. I don’t make wimpy, brothy soups though. They need to have some heartiness to them. I want to be full after I eat my soup! My education at the ATC was more like a job than a culinary program. We were the college cafeteria, but everything we learned was hands on, so it was still fun. Anyway, one of my favorite soups that I made at the ATC was this Chicken Mulligitawny Soup, which is a creamy chicken soup with apples and curry. It’s so unique and has a sweet and savory theme going on. Yum! 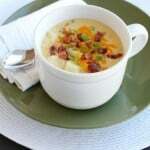 I hope you take the chance to check out all of the soups on my blog, but let’s get to talking about today’s recipe. 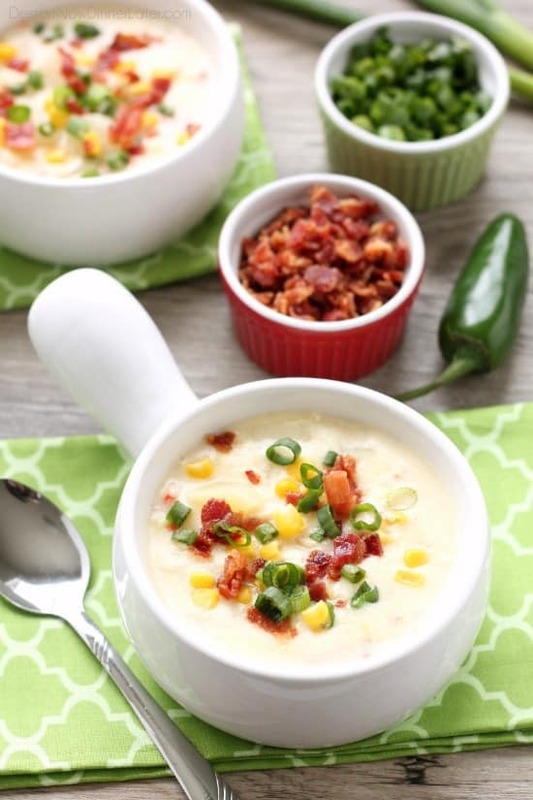 Cream soups are my absolute favorite, and this corn chowder is comfort food to the max! 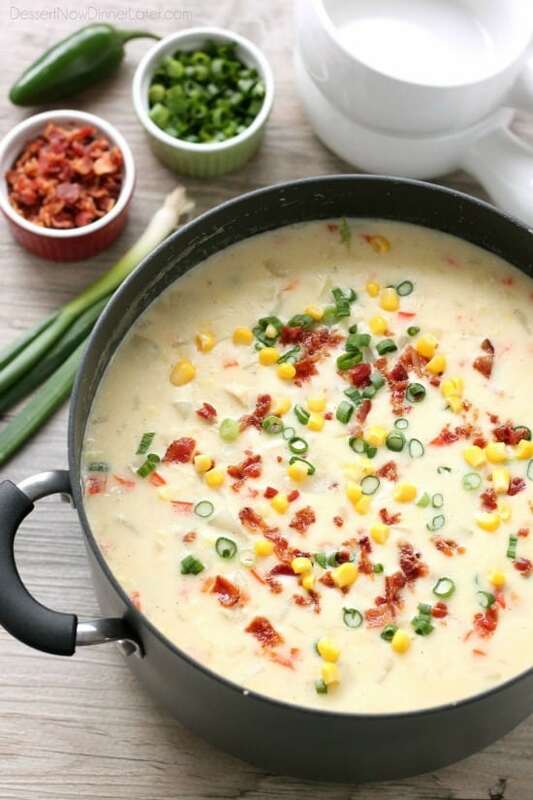 It has chicken, bacon, potatoes, corn, and green onions. Oh! And a jalapeño pepper for a little kick after every bite. It’s not too spicy, but you can certainly add more if you like it spicy though! Can I just say anything with bacon has my name all over it. I use the bacon fat to cook my chicken in too. Hey! It’s either that, oil, or butter. I pick bacon fat when I have it! My, oh my! You are going to love this! It makes a lot, so be hungry or share with friends. 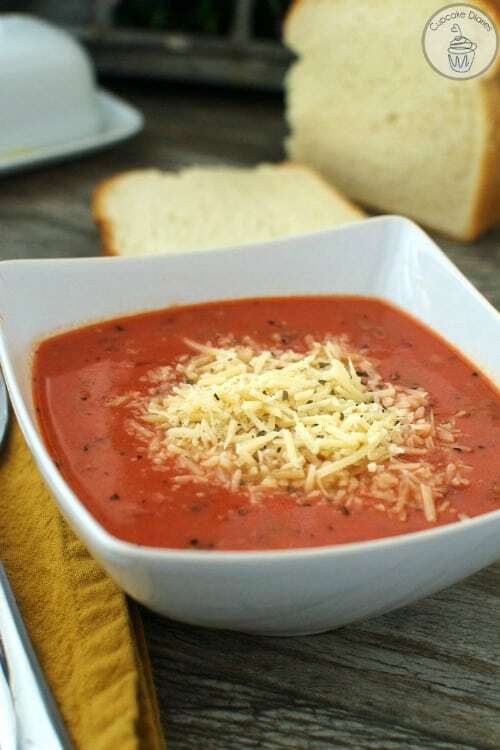 Enjoy, and be sure to check out the other 10 soup recipes below! Cook bacon until crisp and save ¼ cup of the fat. Allow bacon to cool, the crumble or chop into small pieces. Heat the bacon fat in a large stock pot (add butter if you don't have enough bacon fat, but you should have plenty). Add the cubed chicken breasts and cook until almost done. Add the peppers, onion, and garlic. 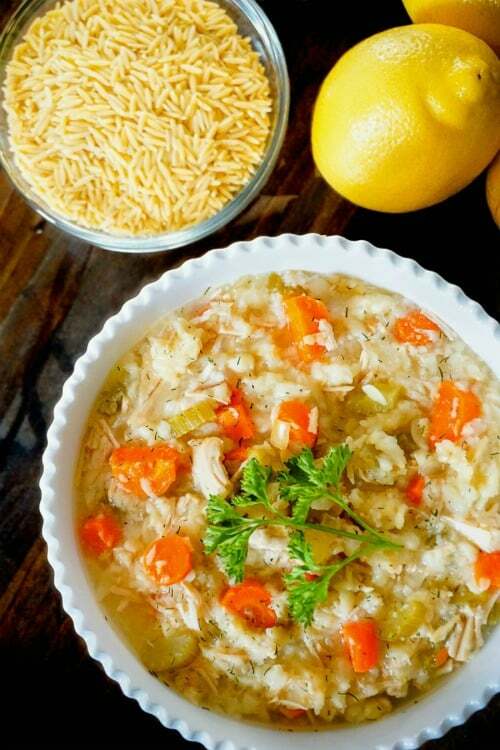 Cook until vegetables are soft about 5 to 7 minutes. Add the flour to the vegetables and cook for 2 minutes. Slowly stir in the chicken broth. Add the potatoes and bay leaves. Season to taste with salt and pepper. Simmer for 10 minutes. Stir in the corn and half & half. 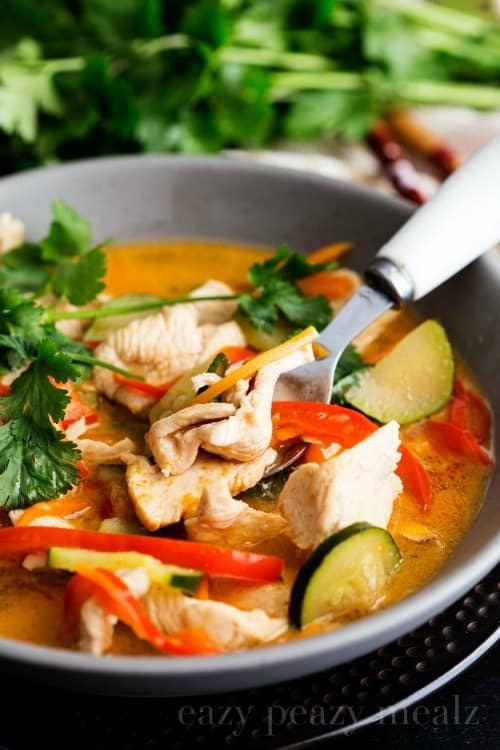 Simmer an additional 10 to 15 minutes until thick and creamy. If you want it slightly thicker, you can add a cornstarch slurry, if needed. Whisk 1 Tbsp of cornstarch with 1 Tbsp of COLD water, and then stir it into the boiling soup. Add the crumbled bacon and sliced green onions. Check and fix seasonings, if needed. Serve hot. Enjoy! 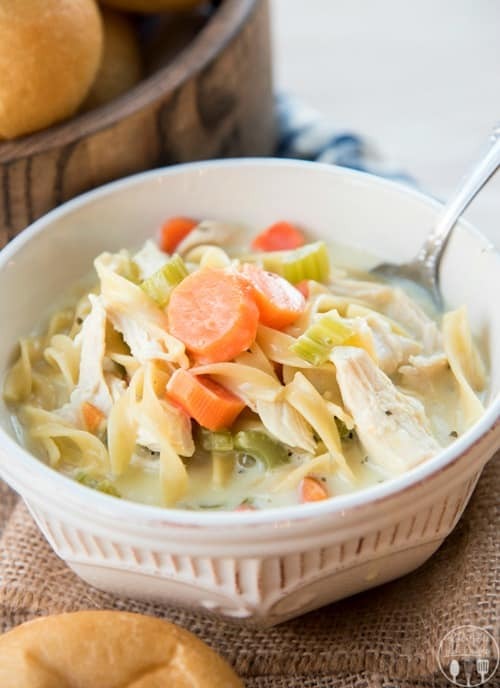 If you love soup, you aren’t going to want to miss this lineup of scrumptious soup recipes that will keep you warm through winter! 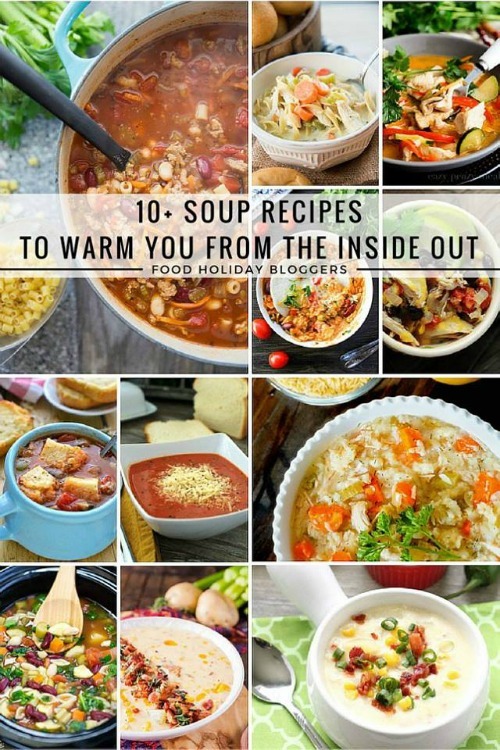 I love soup SO much – so this collection is blowing my socks off! SO many great ones to choose from. 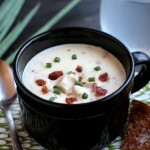 I’ll definitely be trying your chowder! I seriously eat soup once a week in the winter. Then at least once a month in the warm months. So yummy! Thanks Yvonne! So fun that you got to go to an ATC in high school to test out the culinary program! 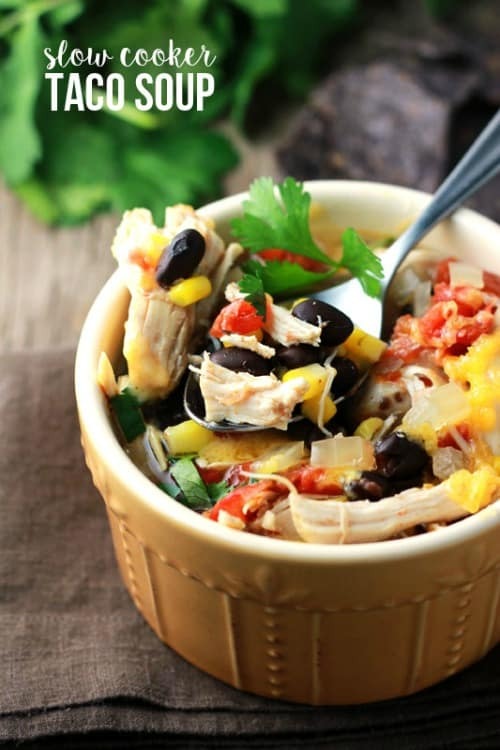 I can have soup all year long and this one is next on my list! It looks SO creamy and delicious! Yes! It was fun! I too eat soup year round Kelly! I hope you like this one! I hate mushrooms too! 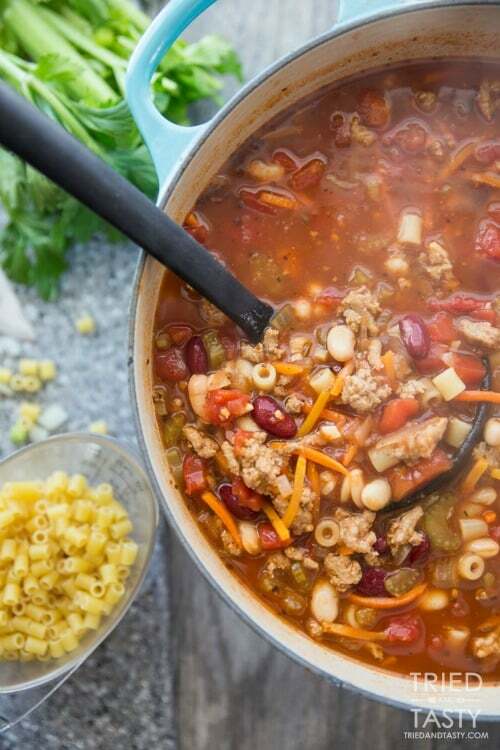 😉 This soup looks awesome! 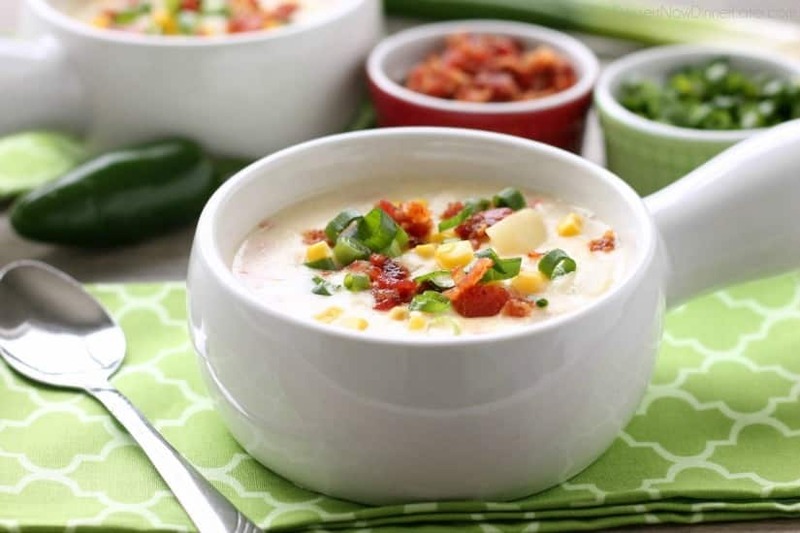 I love the addition of the jalapeno for the kick! Phew! Glad I’m not the only one who hates mushrooms. 😉 Thanks Aimee! I hear ya on the whimpy broth like soups! I’m all about the creamy versions. This one looks yummy! 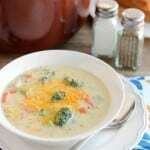 Yeah, my soups are like 80% chunky 20% brothy and cream soups are definitely my favorite! Thanks Jess! 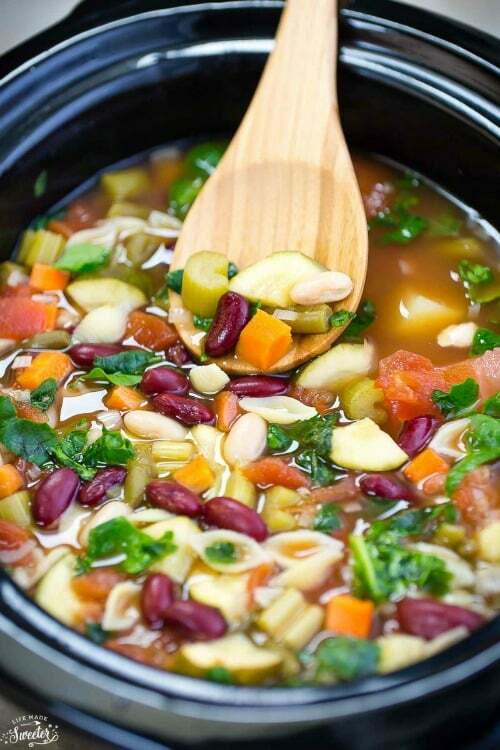 I love making homemade soups! 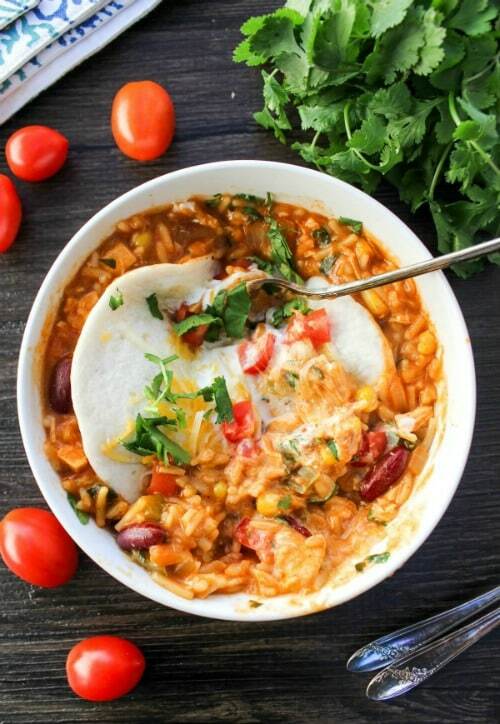 I hate how salty (and sometimes soggy) store-bought and restaurant soups are. 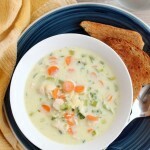 This chowder looks amazing! 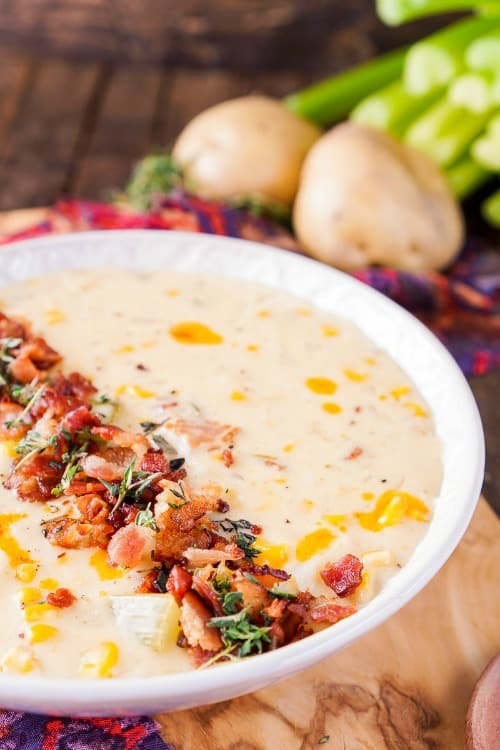 You can’t go wrong with creamy, bacon-y dishes! Right?! Store-bought is just not going to cut it in my house. Haha. Thanks Jess!